https://open.spotify.com/album/70IVhOOxJtQFTm9POnGgl2 1 month 3 weeks ago. planning some live gigs in the near future 3 months 1 week ago. BLOB updated their profile picture. BLOB's 15th release (recorded at Sound Hive studio ©2017) with special guests Neil Neil Nail Alexander on keys, Chris Pasin on trumpet, Don Davis and Adam Seigel on reeds. 1 year 2 months ago. BLOB added a new photo — with Chris Pasin and 5 others at Sound Hive studio. BLOB's 15th release (recorded at Sound Hive studio ©2017) with special guests Neil Neil Nail Alexander on keys, Chris Pasin on trumpet, Don Davis and Adam Seigel on reeds. 1 year 2 months ago. BLOB added 5 new photos — with Harvey Sorgen and 5 others at Sertso Studio. 1 year 2 months ago. BLOB is an electric instrumental ensemble experience that focuses on performing and recording its spontaneously created theme-based journeys that embrace a multiplicity of genres, taking their burgeoning legion of followers to exciting energy- and spirit-driven spaces with each foray. “Blob”? A bubbly globule of liquid sound that has no distinct shape or definition, replete with daubs, as of color, mixed into a soft, amorphous mass. Viscous enough to hold together despite tugging and squelching in different directions. “Earphonious”? Harvey Sorgen’s father once remarked to him, while he was still a burgeoning drummer practicing incessantly at home, “Son, your music just isn’t earphonious, it’s really not.” So that explains that part. A BLOBinition of swamphony: A wet, spongy place, having growth of certain types and an effective combination of colors, but unfit for cultivation. Take your malaria shots and keep your sense on high alert. John Lindberg has been a seminal figure as a composer/bassist in the world of creative music for well over thirty years, having toured worldwide performing his own work leading a variety of ensembles, with the String Trio of New York, and as featured bassist with the Human Arts Ensemble, Anthony Braxton, Kevin Norton and Wadada Leo Smith. His vast and diverse discography includes solo bass works, multiple small mixed ensembles, string quintets, large chamber ensembles, JazzHopRevolution (his recent collaboration with hip-hop emcee Rahman Jamaal), and beyond. Ted Orr is a renowned guitar virtuoso and an innovator in the arena of MIDI guitar performance. He has recorded and/or performed with a wide span of artists including Sly Stone, George Clinton & P-Funk, Karl Berger, and Nana Vasconcelos. Harvey Sorgen has developed a unique and broad-based drumming vocabulary that has added vitality to the works of artists ranging from Hot Tuna, Dave Douglas, David Torn, Bill Frisell, Greg Allman, and Garth Hudson, amongst many others. He maintains an active presence as an international touring and recording artist in high demand. 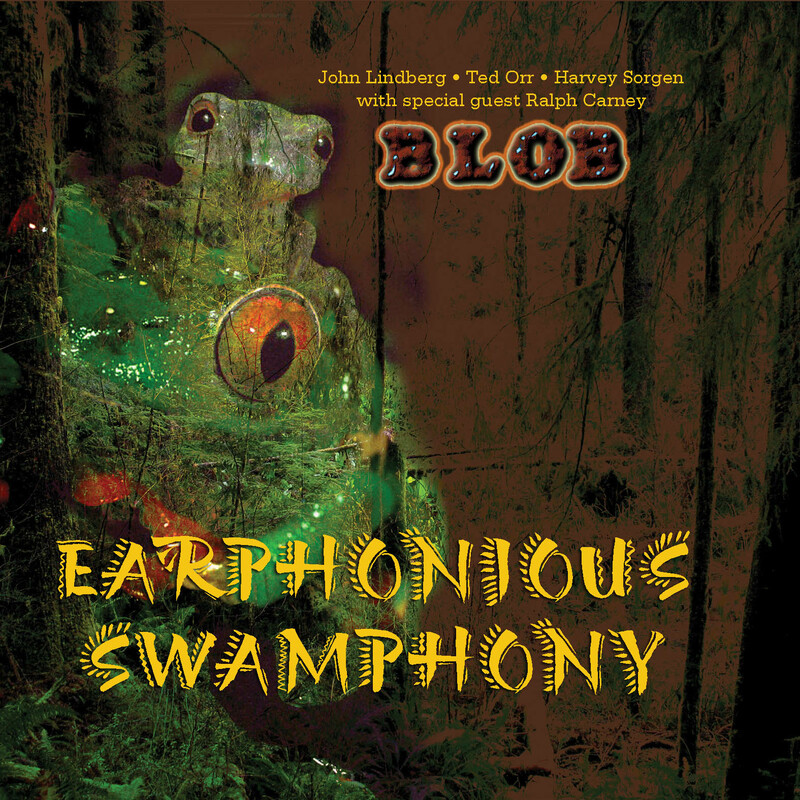 [Earphonious Swamphony is] music of the nigh-time swamp with frog noises and shudders and heaving birdsong. You are also confronted with the grinding and grumble of jazzy dissonance and drum-set melee. "Blue Trees" features primeval creature pulses while "Muck" plays with cicada noises and wah-wah effects. "Sweat" takes us back to … nocturnal mangrove noises while "Lagoon" is fraught with warbling and wibbling--just a hint of The Creature from the Black Lagoon. This is music of the Everglades--alligators, exposed roots, writhing snakes, mudflats and high humidity.